Insurance companies and their customers seem to be perceiving each other from the opposite ends of a telescope. An insurance company call center may get hundreds or thousands of calls from customers per day – dealing with issues from claims to billing questions to address changes to coverage questions and requests for additional coverage. Any individual call is just one of thousands of routine interactions and the insurer simply goes about its business. After all, the call center is not a core operation. Insurance executives like to hobnob with actuaries and sales people, and talk investment, risk and new business. Too often, the call center – and the customer experience – is an afterthought. And that’s how they treat customers. On the other end of the telescope, the customer perceives the interaction very differently. When a customer calls with a problem or claim, the interaction is anything but routine – for them! This call may be the only direct contact with a live body from the insurance company in years and it can make or break the lifetime value of the customer for the insurance company. As a result, companies that neglect their customer interactions after the sale have a hard time hanging on to new business. Over time, customers get fed up with their bad experience and move to new insurers. If they find one that excels at customer service, they will stick. A recent study from Watermark quantified the benefits of a superior customer service effort in the insurance industry and found that the customer service advantage isn’t just theoretical. A quality customer experience has an immense ROI and provides enduring value to shareholders. The study compared the stock performance of publicly-traded insurance companies with good and sub-par customer experience ratings, as defined by the results of the annual J.D. Power and Associates annual Insurance Customer Satisfaction Study. The result: Companies with excellent customer service and customer experience routinely outperformed those who scored poorly on customer service skills. 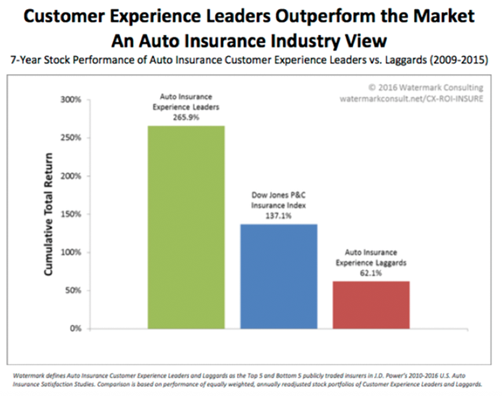 For example, in the auto insurance category, customer experience leaders outperformed the broader S&P Property & Casualty Index by 129 points over seven years. 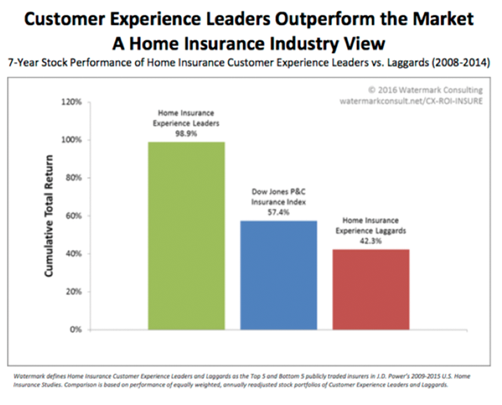 Watermark found a similar trend in home insurance, with customer experience leaders beating the Property & Casualty Index by 42 points. Meanwhile, those companies with poor customer experience scores according to Watermark’s metrics tended to underperform the Index. Over the seven year period Watermark studied, auto insurance companies that excelled in the customer service area generated nearly triple the average annual return of the laggards. The Watermark study isn’t an outlier. Another recent survey from McKinsey & Company likewise found that the most profitable auto insurance companies and the ones generating the most shareholder value are consistently the very same ones that are offering the best customer engagement experiences. It’s not even close. The McKinsey study found that those companies that consistently delivered best-in-class customer experiences generated 100 to 300 percent more new business growth, and about 30 percent higher profitability than firms that had an inconsistent customer experience. Why? In part, because customers with high satisfaction ratings are 80 percent more likely to renew their insurance policies than those that were not happy with their experiences interacting with the company. McKinsey found, unsurprisingly, that companies with high customer satisfaction ratings posted higher revenues, had better customer retention, less price sensitivity, greater wallet share and positive word of mouth. They experienced better success rates for cross-selling activity, so not only did customers stay with the company longer – they generated more premium. They also experienced lower expenses, thanks to lower costs of customer acquisition, fewer complaints, and the simple fact that happy customers are actually much less time-consuming than unhappy ones – and naturally more willing to recommend your company to their friends and families. “Today the consequences of subpar service are amplified by the speed and reach of social media,” warned McKinsey’s analysts. Make customer service a quality part of your brand. Yes, it costs money to invest in good technology and excellent customer service personnel. But being forced to compete on price alone because your customer retention is bad and you don’t get word-of-mouth referrals from happy customers costs much, much more. Elevate quality customer service responsibility to the CEO and Board level. Managers must place leadership emphasis on the importance of a quality customer engagement on every call. Embrace the phone. Yes, the tendency in recent years has been to attempt to automate everything. But according to research from Frost & Sullivan, customers still overwhelmingly try to reach a live agent, and are much more satisfied with their experiences after engaging with a real live human being than they are after entirely automated engagements. Remain open to feedback. Regular phone contact is an important part of your information feedback loop. Without it, you are flying blind. Customers will tell a live agent how they feel about your company over the phone. They cannot tell you using a fully automated process. At best you’ll rely on emailed comments the vast majority of them will never send. Find ways to exceed expectations with every customer contact. Because actual contact with customers in the insurance business is so rare, each contact that does occur is extremely important. In many cases, it will be the customer’s only direct interaction with the company. Make communication possible across a variety of platforms. Think phone, SMS, smartphone, apps, your website, email, snail mail, and even Twitter and other social media sites. Invest in training. Customer service knowledge and professionalism was a key component of customer satisfaction. Talk with customers. Find out ‘pain points’ and ‘wow moments’, and deploy resources and energy to minimizing the first and maximizing the latter. Wait times are important, but they aren’t everything. One large auto carrier found that customers were much more interested in having a consistent point of contact for everything related to their claim or issue than in having a short hold time on the phone. If it’s bad, he or she will likely go elsewhere. Indeed, you may have created a brand ambassador – for somebody else!